I Love Christmas. It is by far my favourite time of year and what I love most is the build up - the music, the movies, the food... the 1 million social events that are going on - I love it! 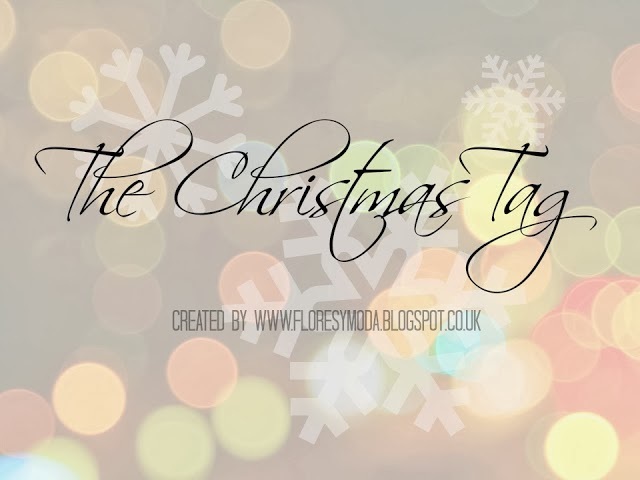 So when I was tagged to do "The Christmas Tag" by Rebecca at Flores Y Moda I did a high pitched squeal, got out a mince pie and sat down to check out the questions! Hmm... this is a tough one! I feel like I'm going to have to say Mariah Carey - All I Want For Christmas Is You! A total and utter obviously classic and obviously choice too but just the sound of the first few jingly notes gets me so so excited! I love it when the little girl sings it at the end of Love Actually! Also the fact that Ariana Grande is releasing Christmas songs has me very much excited! I have about a million! I love Love Actually (obviously), The Grinch (Taylor Momsen is a babe! ), Home Alone 1 & 2, The Holiday, Elf (big lols), Nativity (more lols) & The Santa Clause! I really don't know, I keep being asked and I just don't know! 5. What is your favourite festive makeup or nail art look? I am really loving dark lips - I did a whole post recently on my favourite purple shades! Dark sultry colours are fab on eyes, lips and nails - gorgeous! I also love glitter nail shades for christmas - I have red glitter at the moment and it's making me feel super festive! Normally I would always stay in my pjs, I love being cosy on Christmas morning - running round in my onesie! 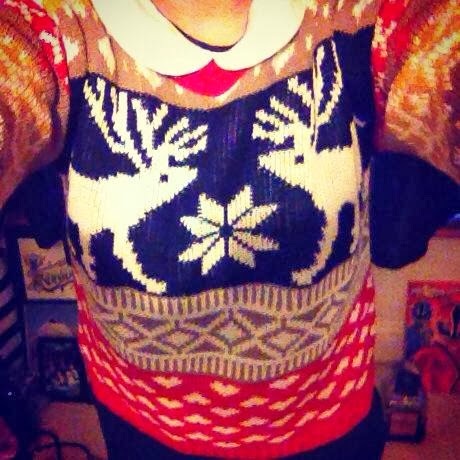 But as soon as other people come round I pop on some normal clothing - nothing fancy though. And believe it or not... I've never really made an effort with make-up or hair on christmas day before (don't judge me!). 7. Would you rather play out in the snow or enjoy it from inside with the fire and a cuppa? Ooo can I not have both? Play in the snow until I am too cold then head inside for a cup of tea nd a mince pie - perfect! 8. Wrapping presents - love or loathe? Well... Christmas dinner is by far the greatest meal ever invented. Also...Mince pies!!! Ever since I was little I have always loved them - and never understood how other people can't! That feeling you get - you know what I mean, the dark nights, the lights, the deorations, the foods, the music, the movies - everything just gives you that excited festive feeling! I tag you ALL to do this tag! 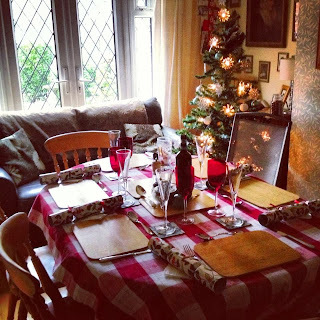 If you love Christmas like I do..... get involved! Such a nice read! I'm saving for the Urban Decay naked Palette 3 too, its just gorgeous for xmas, xoxo. Eeek I love Christmas and am starting to feel super festive already - never too soon! I do love winter for so many reasons I must say (I'd say it's my favourite season!) Lovely tag, would love to do it myself very soon! Such a fun post! I can't believe that Christmas is only a month away! That's such a fun tag!! Getting my christmas shopping done now. What a great tag!! Loved your answers, I hate wrapping presents too, so annoying, I always want them perfect & it never ever happens! Gorgeous post and tag! Mince pies are the best!!! All warm and hot haha!